After flying into the airport in the town of Puerto Baquerizo Moreno on San Cristobal Island, we took a panga to the M/V Eric, the small Ecoventura cruise ship with room for 20 passengers plus crew, on which we spent the next 7 nights and 8 days. A full 97% of the Galapagos islands are preserved in the Galapagos National Park. Visitors to the national park can only go to designated visitor sites, and must be with a guide. 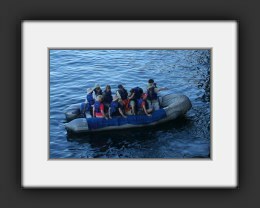 Groups of 10 take a panga or little boat to the land from the larger cruise ship. Our first stop was San Cristobal Island's Playa Ochoa, with a "wet landing" (where you have to hop off the panga into about a foot of water). 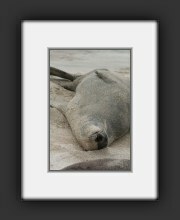 We snorkeled and hung out with Galapagos sea lions. 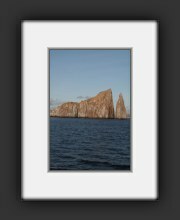 Later in the day, as the sun went down, we cruised past Leon Dormido or Kicker Rock, a massive tuff rock formation that has nesting sea birds on it. 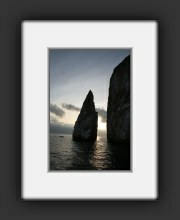 Leon Dormido, or Kicker Rock. 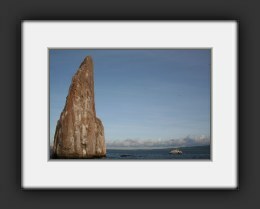 The M/V Letty approaching Kicker Rock. Karina called these "breaded" sea lions. 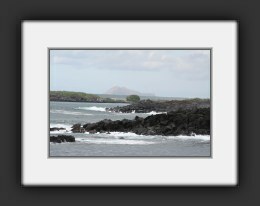 The lava rock of San Cristobal Island. 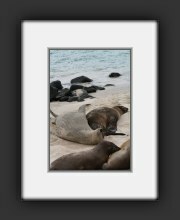 Galapagos sea lions playing on Playa Ochoa. Notice the nursing pup in the foreground. A shot of the panga. 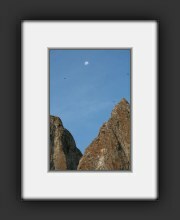 Three quarter moon over Leon Dormido. 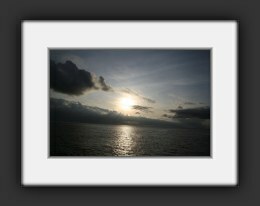 A beautiful first night sunset.